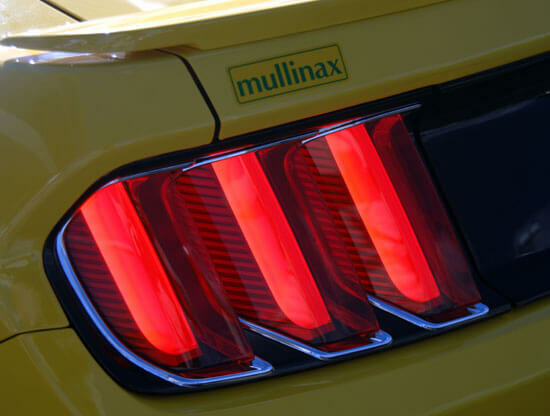 Our friends at Mullinax Ford West Palm in Lake Park, Florida invited us up the other day for a photo shoot of the new 2015 Mustang GT Premium Fastback, the top model of 5 Mustangs in the new lineup. This one had just landed on their lot off the transport truck the other day. 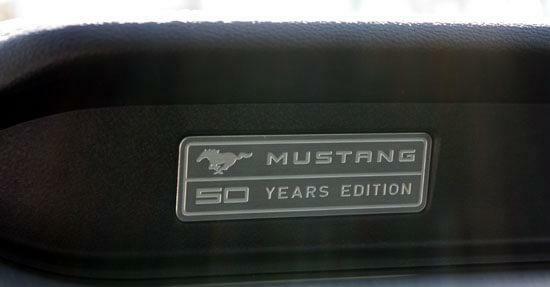 See all our photos and details of this top of the line 50th Anniversary Special Edition pony below. The new car we photographed and reviewed here for you is a 4 passenger, 2 door coupe with a 5.0 L TI-VCT V8 engine and a 6-Speed Select Shift Automatic Transmission. It also had a Triple Yellow Tricoat exterior with Raven Black Leather interior. Installed options and packages on this already loaded premium model include the Equipment Group 400A (standard), Enhanced Security Package and the 50th Anniversary Package. 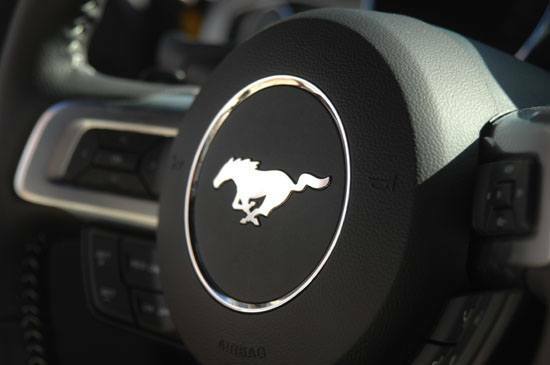 Keep in mind that the 2015 Mustangs are a completely redesigned from th ground up, starting from scratch. Not a single part is the same from any earlier pony versions. Even all three engines are brand new they are not based on any prior engines. So when I saw forum comments after the announcement last year, I just chuckled when self-proclaimed experts were making fools of themselves on-line stating "it's just a rehash of this," or "all they did was re-skin that." One very big milestone in Ford Mustang redemptive history is that this is the first time that they've had independent rear suspension. Ford did a complete redesign from the current single axle rough riding car that owners have been complaining about for 50 years. They finally designed a sports car to keep up with the rest of the world. Now you'll get a more comfortable ride and with the double ball jointed McPherson struts in the front. You'll have better traction, cornering and control. Ford also claims we get better stopping distance with this re-designed suspension system. Many of you have known us for years as the go to website that helps you get the best price on a new car. But unfortunately with high demand of this brand new car you are not going to see anything below MSRP window sticker pricing for months. 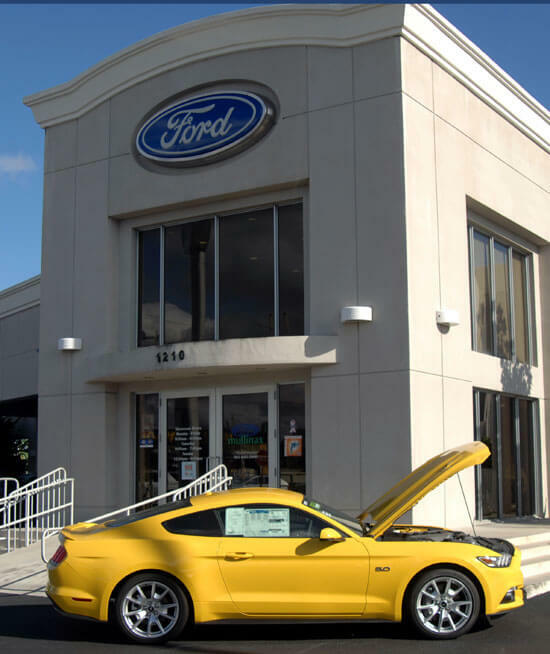 In fact the dealer told us they've already sold all of the dozen or so Mustang models that rolled in off the truck during this past week and they are not haggling the price down at all, they are sticking to their guns. Maybe once the supply catches up with the demand you might see some discounting. 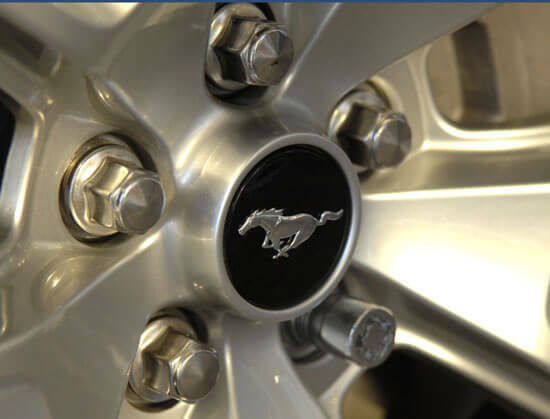 As of this week there are no Mustang rebates, but if you finance through Ford Motor Credit Company, you can get 36 month financing for 0.9% until December 1. 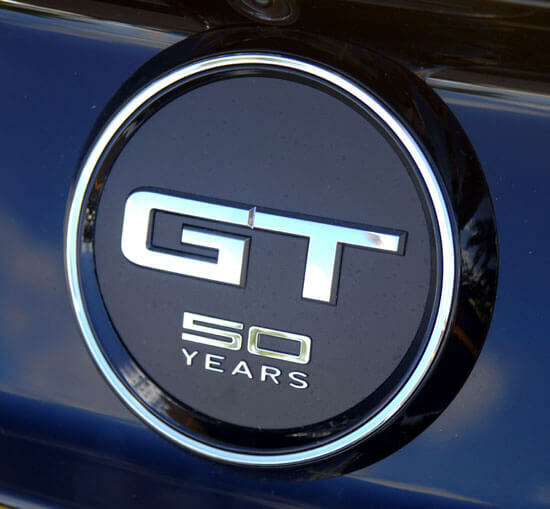 The base price of this GT is $36,100. The price of our car as configured with options and the $1,600 special 50th Anniversary Package is $40,605 including the $825 destination charge. 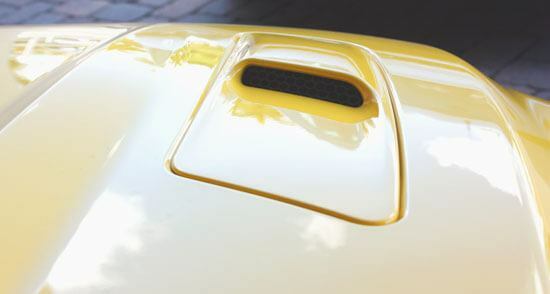 The most obvious treat for your eyes is the Triple Yellow Tricoat paint option, which is only available on the top 2 models. Ford engineers agonized over this and remixed many recipes to get it right. 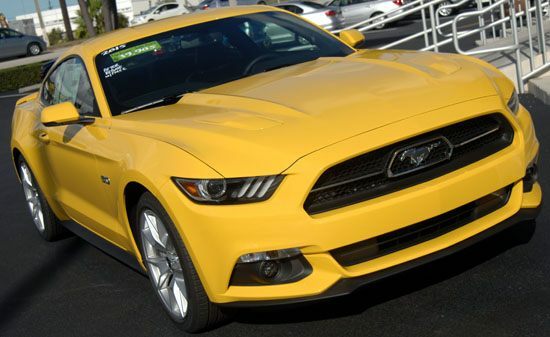 This $500 option is a deep yellow color that just screams racetrack. 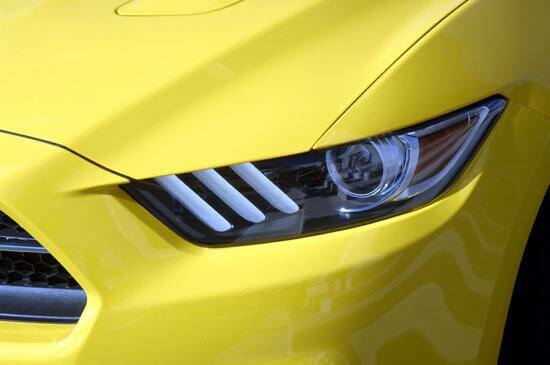 The 2015 Mustang GT looks less of an old school raw muscle car like the 2014 model year did. It seems more like a refined and evolved smoother aerodynamic sports coupe, a little less masculine perhaps. Don't judge a book by its cover. Even though the exterior is tamed down, this car is faster than the Boss 302. Staring at the front end of the car, we see no more driving lights on the grill, a mainstay for many decades. They are now gone, moved to the bottom of the front end, spaced farther apart and are now LED fog lamps. There is a cool set of 3 new slanted ultra-white LED Tribar lights that look like shark gills, adding to the shark nose design of the front end. These white LED lights seem like a carry forward from the new 3 Tribar Sequential Signal LED lights used on the rear end, and are combined with the HID projector Headlamps which are small round and shaped like a magnifying glass. Since we are talking about lighting, this car also has the pony projection lights. 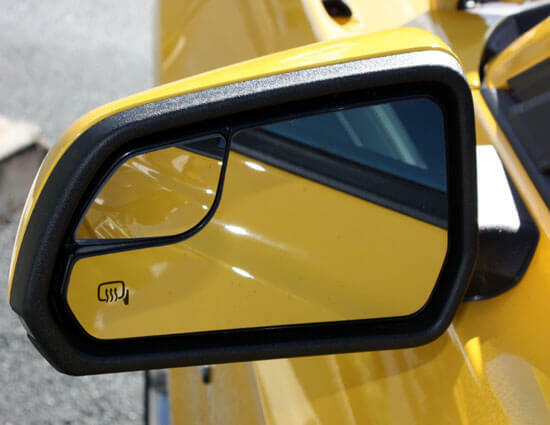 At night, the bottoms of your exterior side mirrors project the famous white pony logo onto the driveway when you unlock the doors. What's up with the weird locking lug nut? 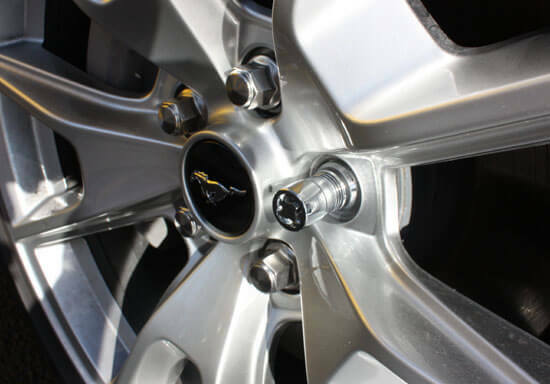 One feature we found to be odd and quirky is the locking lug nuts. 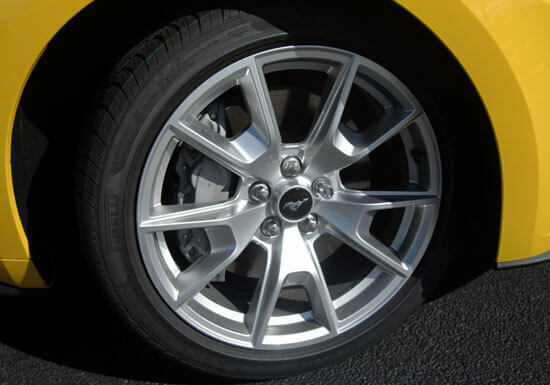 See the close-up photo that shows the one locking lug nut protruding way out, making the wheels look unsymmetrical. With all the effort and careful ergonomic design Ford spent time on, why didn't they make the lug nuts all the same size? I am puzzled by this one. Metal plaque on the right side dash "eyebrow" that reads "Mustang 50 Years Edition"
You can see the obvious Fastback design, still popular with this car. 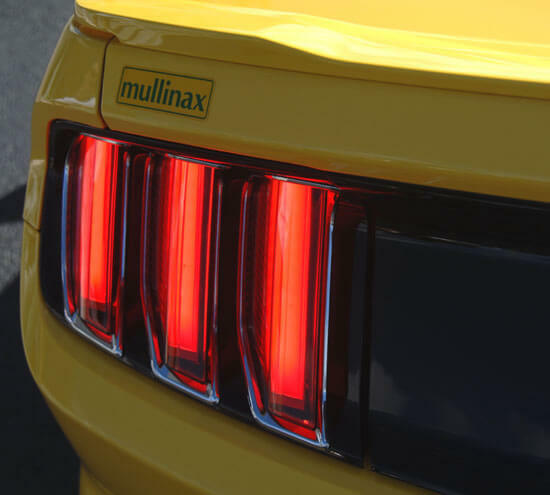 Ford also redesigned the rear lights with a 3D look and wider muscle car look on the back with distinctly angled and spaced out Tribar Sequential Signal LED lights on each side. These were inspired by the 1969 Mustang. 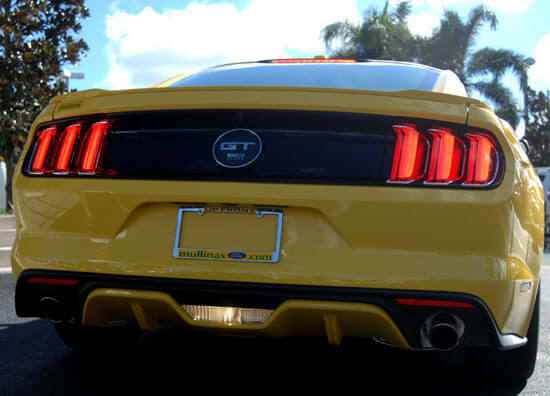 I am impressed with that yellow air channeling heat shield that you see at the bottom below the rear bumper. This is gorgeous and it reminds me of the Ferrari 360 rear end, which uses a very similar shaped shield. 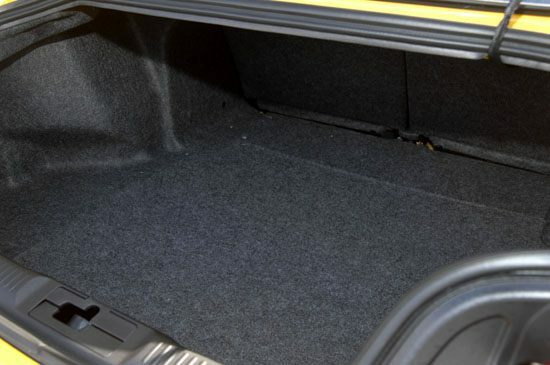 I would bet Ford engineers were inspired by the Ferrari 360 for this feature. As you look down the side edge of this car you will notice the rear wheel wells extend out as a muscular looking haunch to hang over the rear tires a couple of inches. 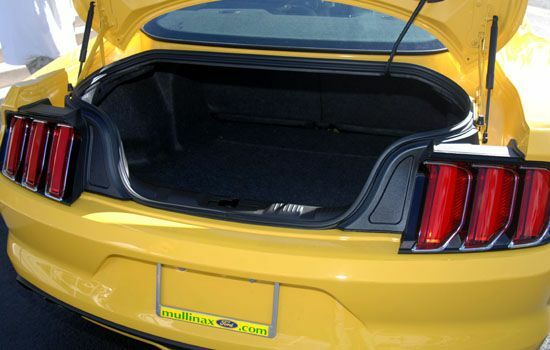 This accommodates the new rear of this car with a 3 inch wider wheelbase than previous year models for added stability. This wider black back end also reminds me of the Ferrari 360 rear end which made good use of a similar large rectangular black space to accent the rear lights, with a muscle car look. 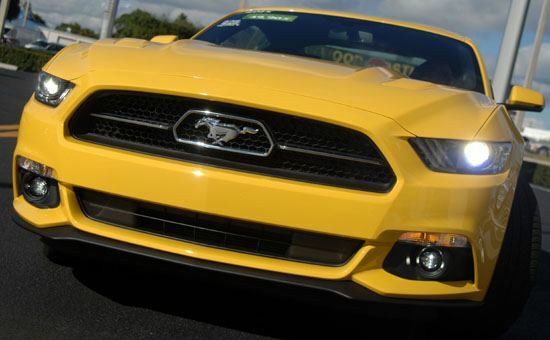 You don't have to spend over $40,000 on a premium model Mustang, other models are not necessarily out of your range; you could buy one of the other cheaper models for example the V6 Fastback starts at $23,600 and the 2.3 liter EcoBoost Fastback starts at $25,170. Take it with a grain of salt though, good luck getting models that are scaled down to that basic "starting price." You can expect most units to have about $3,000 in installed option packages. 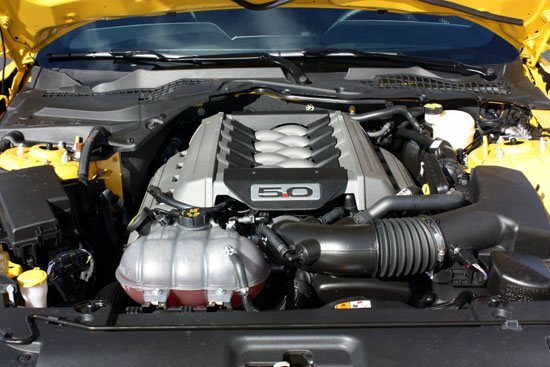 The new 5.0 liter engine in the GT we photographed here replaces the old boss 302 engine; you will not see that engine. There's no need for it anymore. It looks like Ford has fired the Boss. 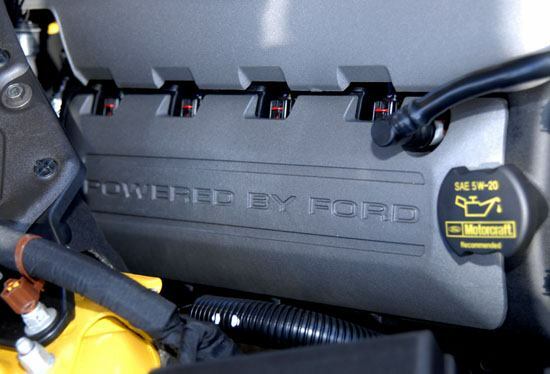 Ford's goal in this complete, ground up, redesign of the 5.0 L engine was to be more powerful than the Boss 302 engine. 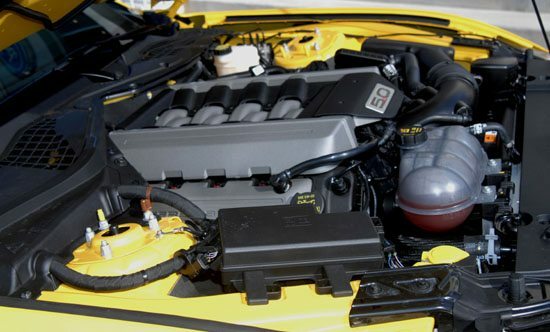 The 2013 Boss 302 engine had 444 HP @ 7,400 RPM and it had 380 ft-lb of torque @ 4,500 RPM. I have also heard Ford executives this year mention the Boss only had 420 horsepower, so who knows the real truth. Everyone plays specsmanship games. Now enter the dragon, the new 2015 engine is also a 5.0L TI-VCT V8 engine, but with 435 hp @ 6,500 RPM 400 ft-lb of torque @ 4,250 RPM. 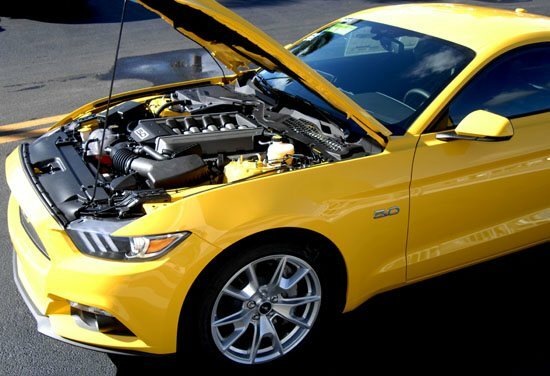 It's a little hard to compare apples with apples for horsepower and torque specs at different RPMs, but it appears the 2015 engine in the Mustang GT is more powerful than the engine they used in the Boss 302. I think this exercise is mathematically academic, I doubt you and I could notice the difference. 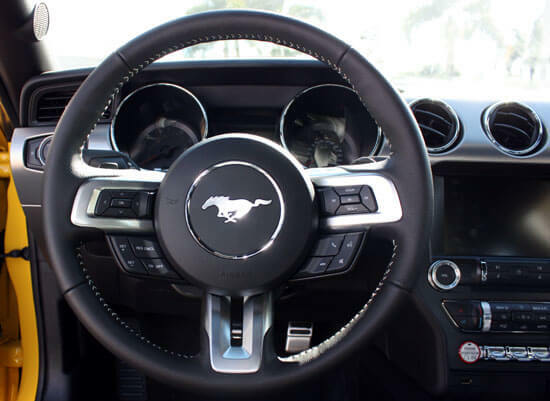 David Pericak, Ford's chief engineer for Mustang had stated last year when they announced the new 2015 model that this 5.0 engine is the most ultimate power and fuel efficient engine that Ford has ever made. Ford's brochure for the Mustang claims it is the fastest Mustang ever. This GT came with the Equipment Group 400A which includes a premium nine-speaker Kicker sound system, heated and cooled leather-trimmed front seats, the dual-zone electronic automatic temperature control (DEATC) and Selectable Drive Modes using aviation themed instrument cluster toggle switches. 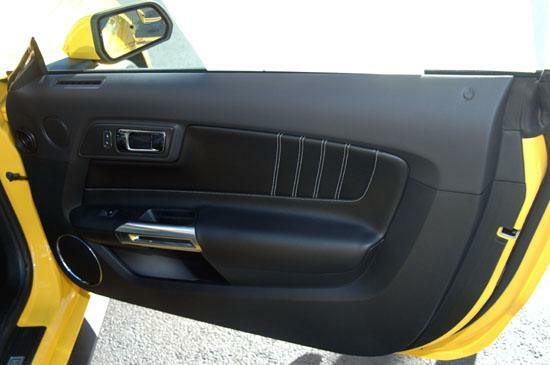 Inside, Ford stayed true to its identity and kept the "eyebrows" both left and right side on the top of the dash. 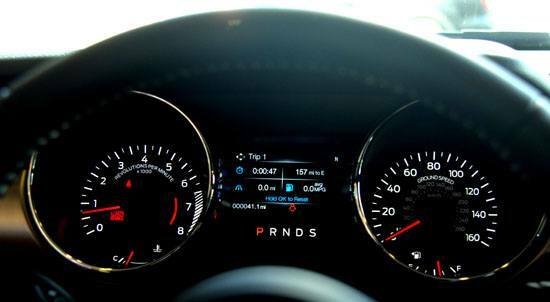 The instrument clusters are brought alive with round clearly placed gauges and symmetry all around. I liked the retro look of the round circular shaped air conditioning vents as opposed to the old school square vents. It gives you more of a cockpit look that works nicely with those ride control toggle switches down at the bottom of the center console. 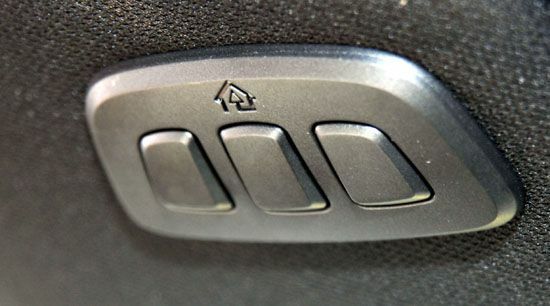 Ford calls it Selectable Drive Modes, which you can select from toggle switches at the bottom of the center instrument cluster, right next to the engine start button. It controls your ride in terms of normal, sport, comfort, etc. They had extracted this feature out of the hard to navigate MyFord system after owners had complained it was too hard to get to it. But now it seems to me it would be a little bit hard to read the labels of the toggle switches during night time driving. 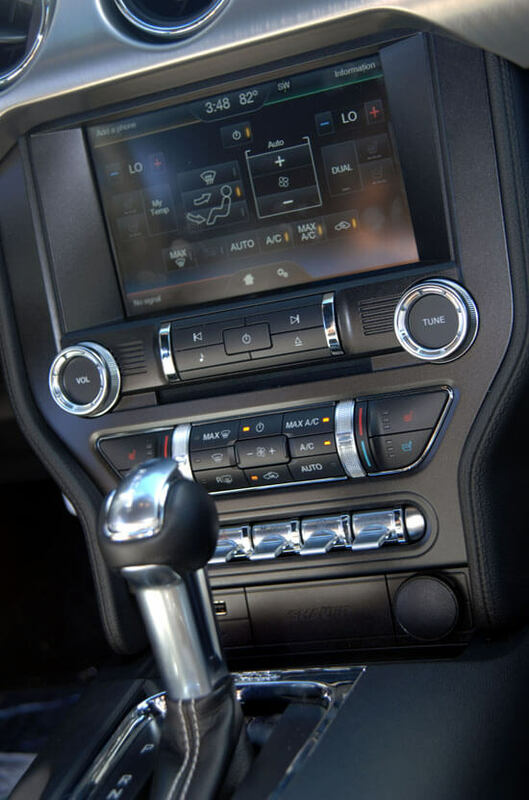 Inside we see the voice-activated Ford SYNC which allows hands-free calls, Bluetooth streaming music and other functions by voicing your commands. Now you can feel like Captain Jean-Luc Picard, "Make it so!" It can download phone contacts, and it can also play music from your phone, or access your MP3 player, USB or iPod. In the center arm rest is a Media hub that will accept an analog audio cable 1/8" mini jack, or USB memory sticks or SD cards that have your MP3 songs loaded on them. The system will read these cards and play it like a jukebox; gone are the days like my old 1998 Lexus SC where you put 10 CDs into a changer; here you could literally fit thousands of songs on your memory stick and listen to it on a cross country trip. 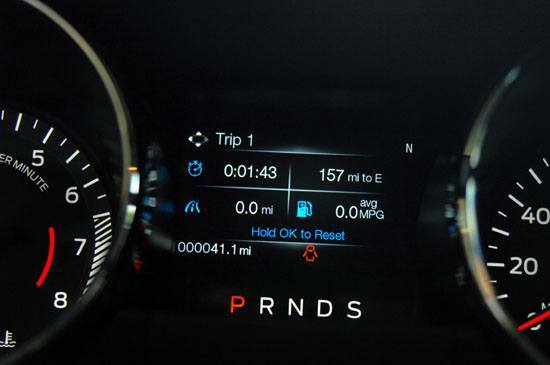 The MyFord Touch information display does a million things, but some notable features include Track Apps, a useful set of tools that are made for the racetrack only. 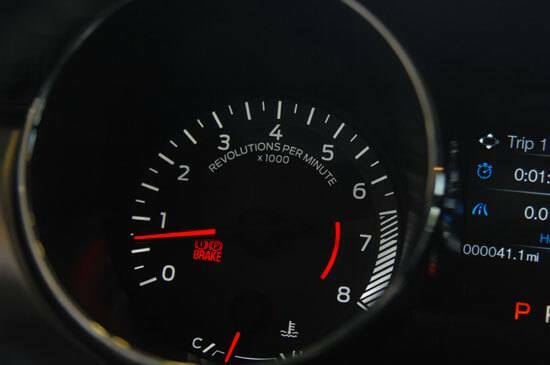 It shows you g's, acceleration and brake performance. You also have launch control and line lock, which allows you to spin the rear tires while the front wheels stay locked at the starting line. The collected data from TrackApps can also be saved. This car also has the Rear View Camera that displays automatically when you put the transmission in reverse. This is big news for Ford owners. 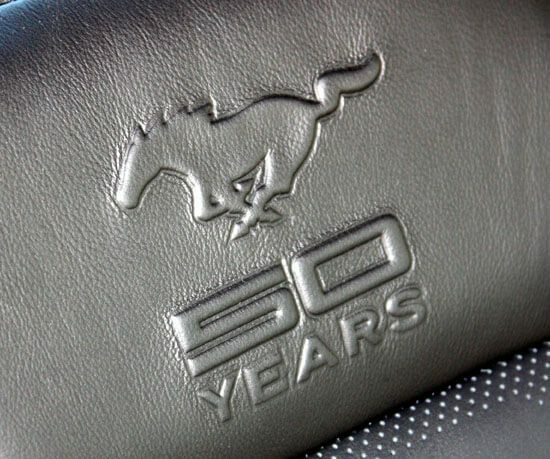 Forget the 50 year anniversary package, forget the powerful 5.0 engine and forget the independent rear suspension. 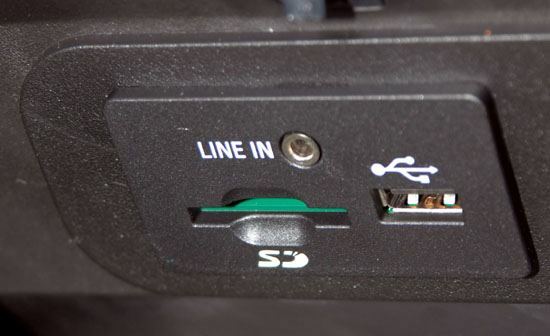 The most important feature on the whole Mustang is the return of the HomeLink! This visor-mounted universal garage door opener replaces your hand-held garage door opener with a three-button transmitter integrated into your driver's side sun visor. For a few recent years, Ford disappointed a lot of people after it broke up with HomeLink and started dating an alternate remote control system called Lear Car2U. 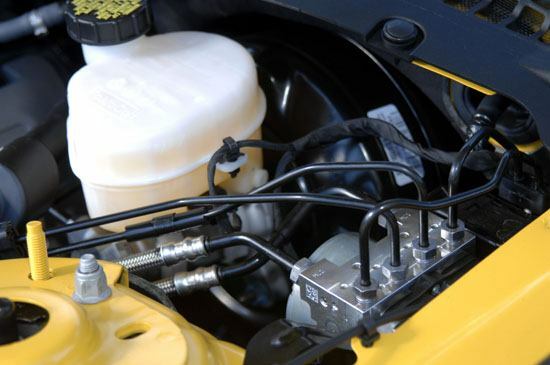 Many Ford owners complained the latter was an inferior system. They experimented with Car2U for a few years, and has finally returned to its first love HomeLink. 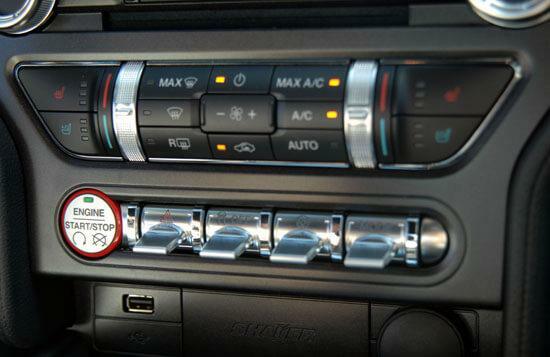 Ford added a lot of fuel to the fire too, by confusing the heck out of many owners, who could not tell if they had the HomeLink system or the Car2u system in their car. 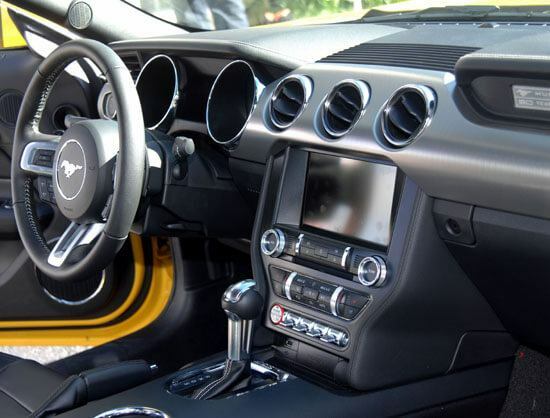 They made 3 versions of the 2013 Mustang owner's manuals. Some showed Lear's system and others showed the HomeLink. But I already know how to tell, the Homelink system has a single LED with an icon of a home. The Lear system has 3 LEDs, one for each button and no logo. I read numerous posts on the Mustang forums of owners complaining that the system in their car would not open certain Genie garage door openers. Owners also complained that the owner's manual showed the HomeLink when it was in fact the Car2U. Thus programming of the remotes did not work, because they were the wrong instructions for the wrong buttons. I would be really mad about that. But wait, it gets better, as if that wasn't enough, owners were complaining the Lear system would not open their garage doors unless they were within 10 feet of it. Others just could not get the system to program and work with the garage door opener or community security gate. To add insult to injury, Lear's web site for the Car2U system tells you that Chamberlain, Craftsman, and Raynor garage openers built after 2011 need a repeater that you have to buy and install on the garage door opener. That is very confusing, so good luck determining if the old Car2U will work with your house. Many owners that ended up with the Car2U system and had incompatible door openers also found out the hard way they have to buy a conversion module, which is an external receiver that is installed on the garage door opener to allow Car2U System to operate with your garage door opener. Either way, glad Ford is back to HomeLink. 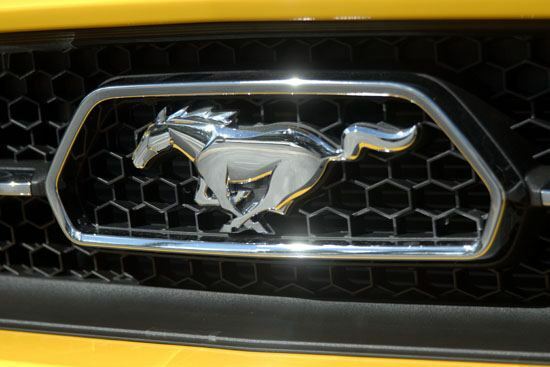 So are you are still on the fence about whether you should buy a 2015 or a 2014 Mustang? I think time will show that the increased performance of the 2015, along with the new engine and the new suspension will outweigh the 2014 decision. 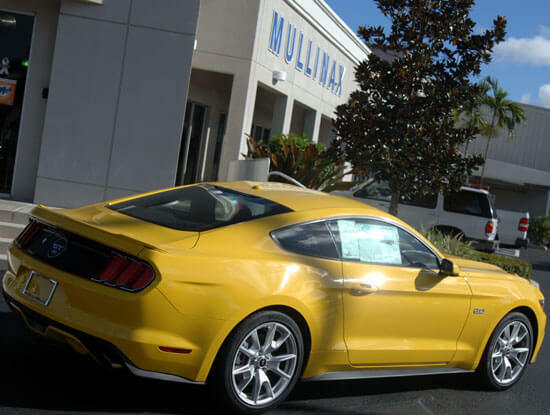 Finally, a special thanks to our friends at Mullinax Ford West Palm, one of the good guys!